The last three years have seen challenging times. Food prices have climbed in every country that doesn’t subsidize its agriculture. There is drought over 2/3rds of all arable land in the world — and arable land makes up only 11% of the world’s land mass. Poverty is escalating — even in North America. In some rural areas in the USA 1 in 4 children go to bed hungry. There’s been a 40% rise in food insecurity in the USA this year, due to drought, under-employment, and rising fuel prices. Investment stocks have been in turmoil — sales are down in many sectors and gold has climbed to $1,900 an ounce. There are the looming threats of Peak Oil and Climate Change, that threaten the survival of the human race in 50 years or 100 years, depending on who you talk to. But today there are people that wonder how they will survive till the end of the year — maybe you’re one of them. 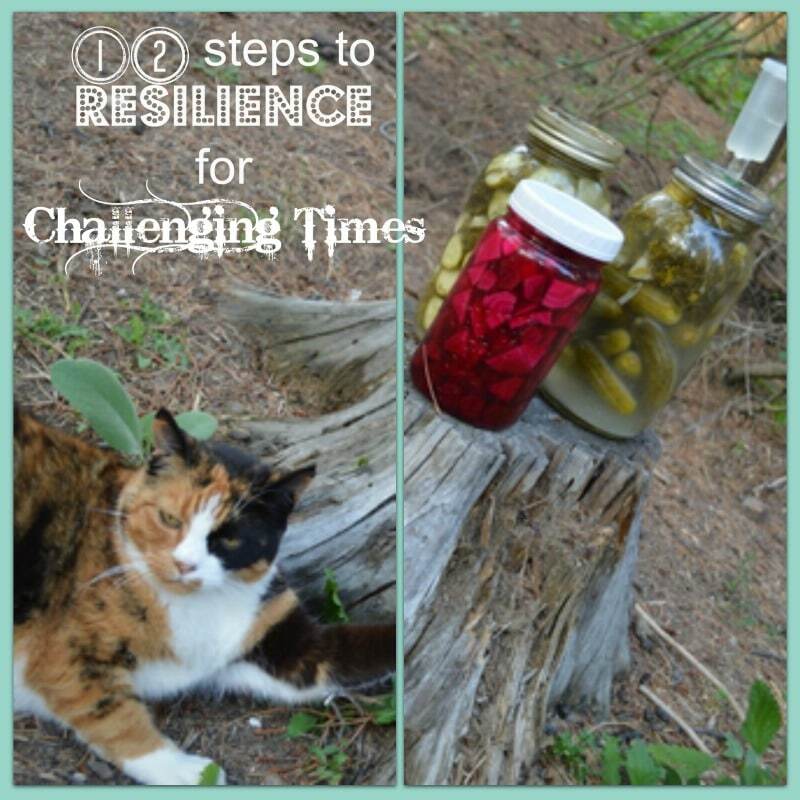 You need to build resilience into your lifestyle, so that you can manage in these perilous times. 1. Plant a garden — even in pots on your deck. If you have a backyard, dig a garden and get some food growing. Lettuce, broccoli, kale, chard can all grow in 30 to 60 days — if you plant now you’ll be eating from your garden in September and October. Living in an area affected by drought? Take the water you wash dishes in or shower in — catch it in a basin and use it to water the garden. A bit of work but not overwhelming. 2. Go for a walk every day. Breath deeply, move your muscles and think of the things you are grateful for. Walking releases endorphins that increase your sense of well being. You will think clearer and your body will increase in stamina, strength and health. 3. Pray. Praying and telling God about your worries and burdens and asking for His help to change things — actually changes things. Don’t believe in God? Praying still helps. Ignore your inner resistance and just do it. Think of prayer as medicine for troubling times. 4. Get out of debt and stop incurring more debt. Debt increases your worries, which decreases your health and well being. But you can stop it. Cut up the credit cards. Get out of the mortgage that you can’t afford. Find a way to live that you can afford — a smaller house, a different neighbourhood, have the courage to change your lifestyle. You really only need a place to sleep, cook and eat, fuel to cook with and keep warm with, — and food to eat. The rest is optional. 5. Start a business. Even if you are working now, begin a business in your spare time. Find the things that you love to do — look for needs that your friends have and see where those two come together. Write a business plan. Then launch. Businesses take time to grow, before they will support a family full time. Start today with your ideas and look for the sweet spot, where what you love will meet someone else’s need. First I tell you to get out of debt and then I tell you to start a business. Does this seem contradictory? I don’t want you to launch with a huge investment — don’t buy a store, don’t stock up on inventory — use what you have on hand. Some people have started successful businesses by crocheting yarn cut from plastic shopping bags — into plastic shopping bags — to meet the need of — “I need to stop using plastic shopping bags and recycle the ones I already have.” Other people have launched successful websites to help other people with their online businesses. Where’s your expertise? Find it. Then write a business plan — don’t start without a business plan — and launch. Get your family involved and enlist their help in every facet of the business. It will teach your kids valuable entrepreneurial lessons — things they will never learn in school. It will provide another source of income — which will give you a cushion in challenging times. www.craftmba.com is a website about creative business. There’s a great free resource in the right margin — a 100 page e-book — that you will want to read. The Creative Pathfinder Course is a free 6 month e-course — delivered once a week to your inbox — to help you move from an idea to a business. Well written and infinitely worth your time. 6. Stock up on food, in season, from local farmers. Learn to preserve it and put it by for the winter. Get into the habit of canning, jamming, drying and fermenting. Food is cheaper in the summer — tomatoes at a dollar a lb. instead of $3.99 in winter. Soon they’ll be 50 cents or 60 cents a lb. Don’t have storage for food? Get rid of something to create more storage space so that you can store food. Utilize under used space — under the bed, in the closet, at the bottom of the stairs. Think of food as gold. You will save money by stocking up now. You’ll spend less on food over the winter. And you can use the savings to pay down your debt. 7. Plan for an emergency –– Get your 5 day emergency kit prepared this weekend. Most governments recommend 3 days but plan for 5 days to have a cushion. Store water, food, clothes, natural soap, batteries, candles and matches, medicines, flashlights and first aid supplies. Get copies of your important papers and ID. Copy all your photos onto a DVD. Get your creative writing or anything else you never want to lose and make a back up on a DVD or thumb drive. Put it all in a back pack and put it by your door. I’m going to add the book “SAS Survival Handbook” to the bag. Do it this weekend. Here’s a check list from the Canadian government to help you along with this task. 8. Reduce your dependence on Big Pharma by making herbal medicines. Check out the Purple Sheep Newsletter for how-to directions for several kinds of herbal preparations. 9. Eat a more healthy diet — high in fruits and vegetables, and quality animal protein and lower in sugar and GMOs. Stop eating at restaurants and fast food places and cook your food at home. You will consume less calories and sugar and more vitamins and antioxidants. And you will save money. 10. Surround yourself with beautiful objects and art — made by you or your artist friends. Art, made with human hands, feeds the soul. You can create it yourself or barter or buy. But fill your home with beauty. Its hard to feel deprived when you are surrounded with beauty. 11. Get organized and declutter your living space. Here’s the one that challenges me. Every day is happier when you aren’t spending valuable time looking for things that you had a few days ago. Invest 30 minutes a few days every week to fill a box for the thrift shop and get those useless objects out of your house. Keep the things that are important to you, and heave the rest. 12. Remove from your life the relationships that cause pain, frustration and feelings of inadequacy. If those relationships are family members — try to reestablish them on a different footing. If they are friends or neighbours — invest your time in the relationships that are mutually beneficial — make new friends around a common goal and be less available to the people that use you and make you feel inadequate. Life is too short to dwell on painful relationships. Have you gotten in too deep in volunteering in your own community? Are the relationships you’ve made through volunteering dragging you down and creating negative feelings and a sense of inadequacy? Its almost September — hand in your resignation and find another outlet to contribute to your community. You can change it. I hope you found these 12 steps helpful in your journey to creating greater resilience in these challenging times. Implement one or two and you will see an increase in stamina and empowerment. Start today to make one change — and tomorrow add another and you will see a difference in your resilience. I am going to get that emergency kit into the Bug-out bag this weekend, and put away 3 – 5 gallon water containers in the storage room. How about you? What are you going to do right now to contribute to greater resilience in your life in the coming weeks? This list is not complete — what would you add to this list to help others become more resilient in challenging times? Leave a comment. What a great list Chris! I love the way it includes preparing for the emotional/ spiritual side. I’m so excited to have more room for storage once we move. I sore some now, but not nearly as much as I’d like! This comment came through fine. Did you leave another comment that didn’t go through?